Mmmm . . . porter. Back in August of last year, I posted an article about my 3-gallon (11-L) all-grain brewing setup. I have a fancy schmancy 10-gallon (38-L) all-grain rig, composed of three 15-gallon (57 L) pots on a frame . . . and a nice 5-gallon (19 L) brewery, composed of two 10-gallon (19-L) pots and a (legally) converted half-barrel for the HLT . . . and in a pinch I have a 20-gallon (76 L) pot and a propane burner stand that will hold it. But I digress. Nonetheless, with my simple 3.0-gallon (11-L) all-grain brewing setup, I can brew in my kitchen and escape the heat of summer. And there are several fringe benefits to brewing at this scale. The biggest is that you don’t need to make a yeast starter when using liquid yeast at specific gravities around 13 ° Plato (roughly 1.052) or less. One fresh White Labs tube or Wyeast XL smack pack, at 100 billion cells, is sufficient. Also, if you don’t have a fermentation chamber, the wet T-shirt method works well at this scale (as the surface area to volume ratio is higher in smaller batches). Plus, your heating and cooling times can be very quick, making for a somewhat shorter brew day. In addition, you don’t need to use a wort chiller — cooling the brewpot in your kitchen sink works fine if you have the time to change the cooling water several times and 5–10 lbs. (~2.5–5 kg) of ice for the final leg of cooling. In retrospect, I really wish I had thought of this when I was living in an apartment in Boston. The only downside is that you yield 3 gallons (11 L) of beer rather than 5 gallons (19 L). All you need, in addition to the usual 5.0-gallon (19-L) brewing equipment, is a 3.0-gallon (11-L) beverage cooler — the kind with a spigot at the bottom — and a large steeping bag to line the cooler. With it, you can brew all-grain beers up to 13 °Plato (OG 1.052), assuming you achieve 65% extract efficiency (with isn’t hard). For bigger beers, just add a little malt extract. And, the whole setup doubles as a 5.0-gallon (19-L) countertop partial mash brewery. This is an all-grain porter I have brewed over 20 times (in 5-gallon, 6-gallon and 10-gallon batch sizes — and most recently in this 3-gallon size). It is a robust porter with a hint of molasses. (If you don’t tell anyone about the molasses, they probably won’t pick it up.) The dark grains and hops are nicely balanced for a delicious aroma, full-flavor and very drinkable beer. This, along with my pale ale, is one my “go-to” beers that I try to have on tap as often as possible. 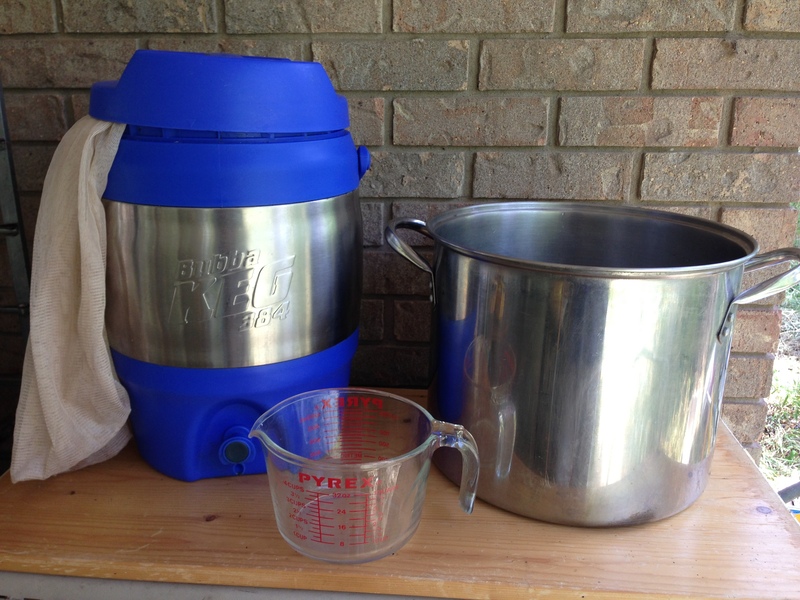 The basic setup — a 3-gallon (11-L) beverage cooler (with a steeping bag to line it) and a 5-gallon (19-L) brewpot. Heat 7.5 qts. 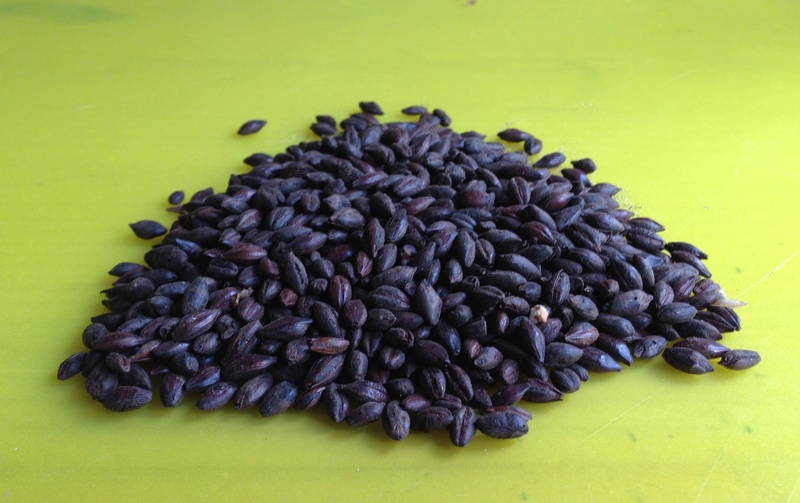 of brewing liquor to 164 °F and mash grains — in your brewpot — at 153 °F, for 45–60 minutes. Stir the mash a couple times and heat briefly to maintain temperature. Heat mash, while stirring, to mash out to 168 °F. Scoop mash into 3-gallon beverage cooler lined with a steeping bag. Recirculate wort until clear, then run off. Sparge steadily over 45 minutes to collect about 3.5 gallons of wort. You will need about 8 qts. of sparge water, at 170 °F, for this. Vigorously boil wort for 60 minutes, to yield post-boil volume around 3.25 gallons. (Top up the boil with boiling water, if needed, while the wort is boiling.) Add hops, Irish moss, molasses and yeast at times indicated. Chill wort, then rack to fermenter. Your yield should be about 3 gallons. Aerate wort thoroughly and pitch yeast. Ferment at 68 °F. After fermentation stops, let beer settle for 2–3 days, then rack directly to keg or bottling bucket. Carbonate to 2.3 volumes of CO2. 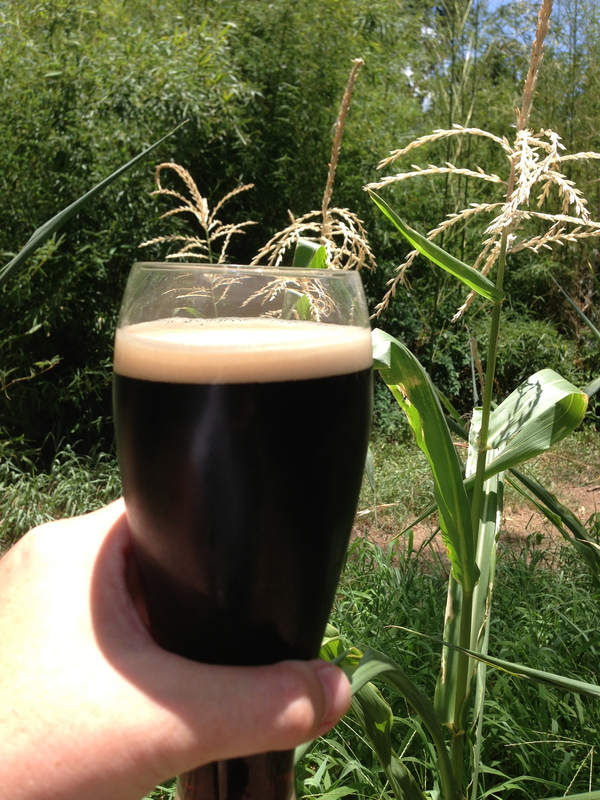 Black malt is at the heart of this porter. Make yeast starter 2–3 days ahead of time. On brewday, heat 7 L of brewing liquor to 73 °C and mash grains — in your brewpot — at 67 °C, for 45–60 minutes. Stir the mash a couple times and heat briefly to maintain temperature. Heat mash, while stirring, to mash out to 76 °C. Scoop mash into 3-gallon (~11-L) beverage cooler lined with a steeping bag. Recirculate wort until clear, then run off. Sparge steadily over 45 minutes to collect about 13 L of wort. You will need about 8 L of sparge water, at 170 °F, for this. Vigorously boil wort for 60 minutes, to yield post-boil volume around 12 L gallons. (Top up the boil with boiling water, if needed, while the wort is boiling.) Add hops, Irish moss, molasses and yeast at times indicated. Chill wort, then rack to fermenter. Your yield should be about 11 L. Aerate wort thoroughly and pitch. Ferment at 20 °C. After fermentation stops, let beer settle for 2–3 days, then rack directly to keg or bottling bucket. Carbonate to 2.3 volumes of CO2. Do you have ppm for the Cl and SO4 in your brewing water as well? Or at least the ratio you’re shooting for? I’ve been trying to dial in the water on my porters for a while now, so I’m curious to see what others are doing. For my porter, I usually add calcium by adding roughly equal amounts of CaCl2 and CaSO4 (as gypsum) to my brewing liquor, so my chloride to sulfate ration should be in the vicinity of 1. Other times, I’ve gone with just gypsum. I’ve never calculated it, but I doubt I’m over 100 ppm Cl- or SO4-2 in the first case or over 200 ppm SO4-2 in the case of just adding gypsum.